The local nonprofit organization “Son of a Saint” was awarded a check for $5,164 as the result of a successful fundraiser during NOLA ChristmasFest. Attendees of the 12-day NOLA ChristmasFest were given the opportunity to make a $5 donation benefitting Son of a Saint. Donators were then entered into a raffle for a 3-night, all-inclusive trip to the Dreams Las Mareas resort in Costa Rica, donated by Copa Airlines. “Son of a Saint” aims to enhance the lives of fatherless boys through mentorship, emotional support, development of life skills, exposure to constructive experiences and formation of positive, lasting peer-to-peer relationships. Boys in the program must maintain a minimum 2.7 GPA, complete eight hours of community service each month and maintain good conduct at home, school and within the Son of a Saint organization. New Orleans Ernest N. Morial Convention Center President Michael Sawaya, called the winner of the vacation, Robert Guesnon, who accepted his prize. NOLA ChristmasFest is an indoor, family-oriented holiday festival featuring ice slides, ice skating, themed inflatables, rides, hand-crafted gingerbread creations and a Christmas display with thousands of dazzling lights. The annual event is owned and produced by the New Orleans Ernest N. Morial Convention Center. Last year’s 12-day festival broke previous years’ attendance records and organizers are working to expand the event in 2019. 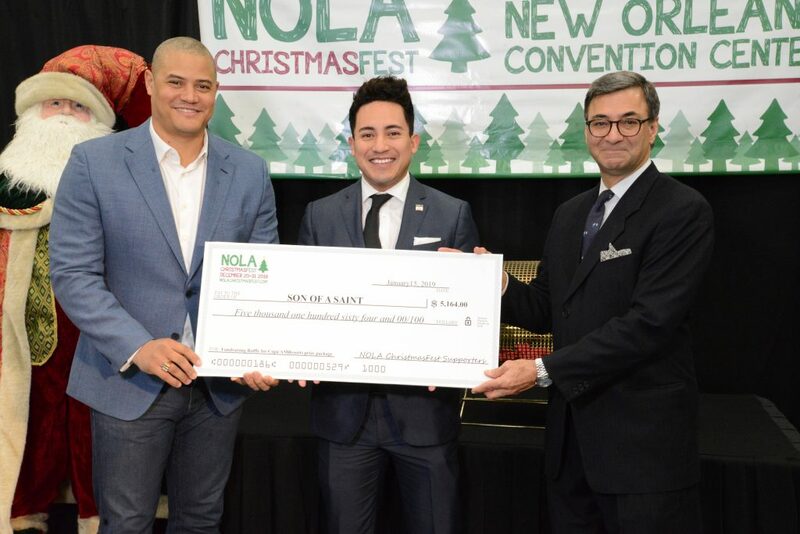 [Left to Right] Bivian “Sonny” Lee, Founder and President of “Son of a Saint”; Ernesto Posadas, Sales Executive for Copa Airlines; Michael Sawaya, President of the New Orleans Ernest N. Morial Convention Center, during the presentation of the $5,164 check to the “Son of a Saint” organization. With 1.1 million square feet of prime exhibit space, in an entirely contiguous hall, the New Orleans Ernest N. Morial Convention Center provides the largest single exhibit space in the country. The New Orleans Ernest N. Morial Convention Center features an award winning staff and first class amenities, and is the sixth largest convention center in the nation. A consistent Top 10 host of the largest conventions and tradeshows in the nation annually, the Convention Center is also one of the city’s “Top Workplaces.” A leading contributor to the city’s robust tourism economy, the Convention Center’s event activity has produced $81.7 billion in economic impact since its 1985 opening, including $5.1 billion in new tax revenue for state and local governments.